The Aquasponda natural swimming pool treatment is of marine origin. Aquasponda improves the comfort and quality of the water while reducing the need for chemical additives. 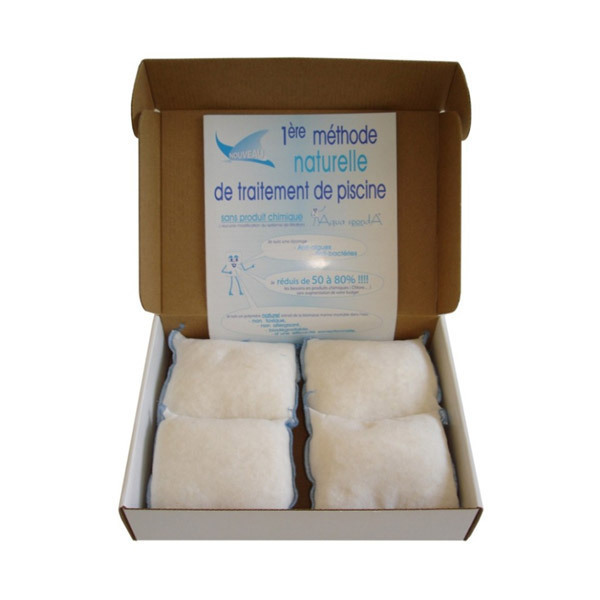 Pack of 4 sponges 100% ecological! Note: During the warmer seasons (temperatures above 18°C water, allow a greater than 8 hours daily for filtration) AquaSponda each sponge can be used for 15 days. - This term effectiveness is measured to 70m3, beyond this replacement should be more frequent. - A sponge dipped in the pre-filter pump is sufficient to treat 70 m3 pool (10x5) for 15 days. - The chitosan flakes placed inside the hydraulic circuit (pre-filter) will flocculate the suspended solids , adsorbing organic contaminants, metals , bacteria that are not normally stopped by the filtration system and allow their easy removal by regular change sponges, thereby reducing from 60 to 80% need for chemicals or algaecides . - A simple addition of chlorine or bromine slow stabilized rate now at 0.5 ppm ( the lowest value on the test kit ) is sufficient to ensure efficiency and absolute hygiene by eliminating odor and irritation of the skin, eyes and hair. - The sponge is not to be cleaned. It is not reusable! Greenweez presents its selection of solutions to filter and save water at home. A range of showerheads, flow restrictors, filter systems for your bathroom or kitchen, including the famous Doulton filter, and many other items. This filtering system for your natural pool is an eco and cost effect way to maintain clean water!